Yamb is a sequence dice-casting game similar to Yacht and Yahtzee and is in public domain. The game has 13 categories to score which are divided between two sections; UPPER SECTION and LOWER SECTION. Each category can be scored multiple times depending upon the number of columns in the game. Each column has a separate sequence in which categories can be scored. There are 4 standard columns which are generally used in the game along with some additional columns which can be used to expand the game. Players can decide how many columns to play for at the beginning of the game. Yamb is generally played for 4, 6 or 8 columns. 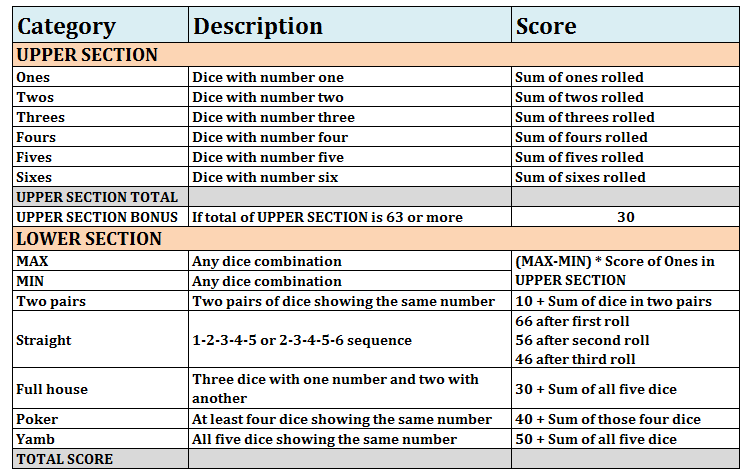 The table below describes each category and its scoring mechanism. Yamb can be played solitaire or in a group of 2 to 6 players. If Yamb is played alone, players can target to improve their best score. In multiplayer game players take turn to roll 5 dice in each round. After each roll the player can set aside one or more dice and then roll remaining dice. A maximum of 3 rolls are allowed to the player in each round. All five dice are available to be thrown anytime in a roll including the ones which were set aside in previous rolls. UPPER SECTION has a bonus of 30 if players score 63 or more in it. 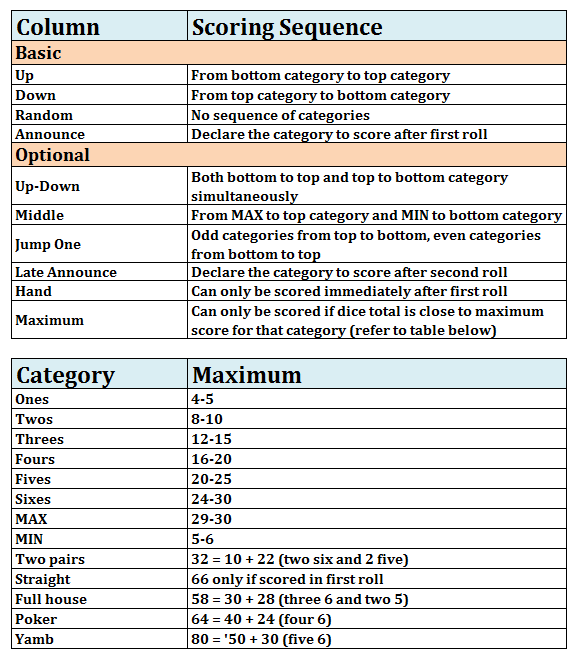 MIN and MAX categories are scored separately but their score is calculated together which is equal to difference between MAX and MIN multiplied by score in ones category. If MAX is less than MIN then calculated value would be zero. Two pairs and Full house are required to have different numbers in the combination so 12222 can not be scored in Two pairs. Similarly 33333 can not be scored in Full house. Once all categories in all columns are played, the player with the highest score wins.